This almost happened to me today, because I went for a (as always, really slow) jog while my sourdough loaf was rising in its bread tin. But I managed to get it in the oven in time! Short update related to yesterday’s waffle post: I made these Overnight Yeasted Waffles this morning, and they turned out REALLY good. Look! I love Emmy’s videos, and I’ve been watching a lot of them this past month since I found the channel, sometimes while cooking. It’s amazing to discover a new channel and be able to binge-watch all the videos. The wonderful, beige, smelly goo that is my sourdough starter is very precious to me. I haven’t checked yet, but I’m hoping there’ll be lots of Gollums on Inktober today for the prompt “precious”. If I got the question: “There’s a fire in your house, what do you grab before running out of the building?”, I think I would answer: “My sourdough!”. If my boyfriend and neighbours were safe, obviously! I’m not Gollum (yet). I actually had a dream last night that there was a fire and I got out of the house in a non-dramatic way. So I decided to go back in through the window to get my phone. Like he thought I was going to do that IRL. Which I don’t think I would do. I have a feeling he wouldn’t react well to me running to get my sourdough starter either. I’ve had one more whole day of baking and cooking (and relaxing a bit in between), because I go back to work tomorrow. I’m on a cooking / baking binge right now and realised that I needed to do bring some food doodles to the blog. Foodles? No. I thought the binge would last maybe the first 3-5 days of my summer vacation, but now I’m on week 3 and still baking away. I made my own sourdough starter right before going on our bike trip and was very worried if it would survive 2 weeks in the fridge (which the recipe said it would). From weird goo to lovely loaf! It seems my starter survived and I’ve fed it and baked some wonderful sourdough loaves since we got home. It seems sourdough is somewhat of a trend (at least on YouTube and Instagram) so now I spend quite a bit of time checking out recipes and images of beautiful bread. 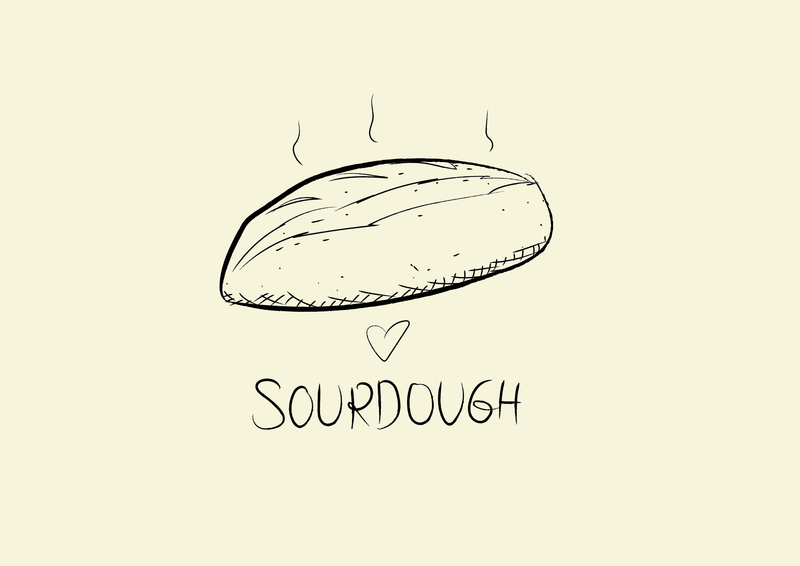 I really like the show “It’s Alive with Brad” on the Bon Appetit YouTube channel and have watched the sourdough episode with Brad and Claire like 5 times. *It’s from the air, I know, but that’s magical enough for me.